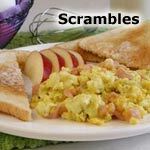 Crumble cheese, finely chop tomato, and whisk or beat all ingredients together thoroughly, as though preparing to make an omelet. Cook in microwave, but for only 2 minutes at a time, making sure to stop and stir well each time. The length of time you cook the eggs is up to you, depending on whether you like them moist or super dry. 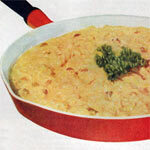 Continue cooking until you reach the desired texture, but remember to stir often and thoroughly. When done, serve with pieces of hot buttered toast and a strong cup of tea. 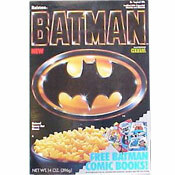 A breakfast of kings that you can make in your castle! 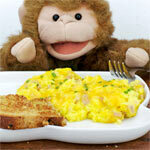 Mr Breakfast would like to thank taintfair for this recipe. 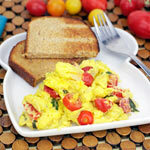 What do you think of Scrambled Eggs with Blue Cheese and Tomato? The smell of hot blu cheese is truly horrendous.